This lens was designed at NPO "EKRAN". It has extended Back Focal Length so it can be mounted on 35mm film movie cameras with 19mm distance between mirror shutter and film plane. 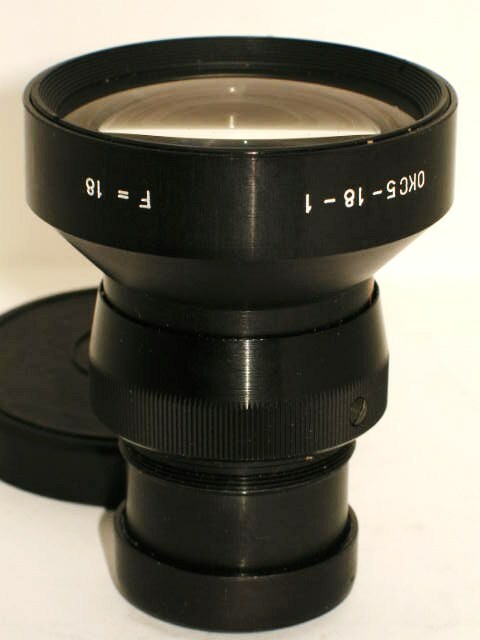 The lens provides acceptable image quality comparable to Cine Prominar 2/20 mm, and superior to Super Baltar 2/20 mm. I had ОКС5-18-1 lenses in different mounts (OCT-19, OCT-19 and other). The lens has only 8 aperture blades, so octagonal shape of the aperture opening is clearly visible. Optical block has no aperture values marks. Also, there are no click stops. Effective relative aperture may vary a little (I saw T/3.1, T/3.2, and T/3.3 samples).